Like millions of other web users I look to some of the large social news websites to find new content. Mainly Reddit, Digg and Mixx. And, like millions of other web users I’m quite busy, so I rely on the RSS feeds of those websites to keep up with them. However, recently the RSS feed for the Reddit front page has become as good as useless. The number of broken links and duplicate stories has steadily increased over the last few months to the point where the noise is drowning out the interesting stories. Take a look at the image to the right for an example of the duplicate stories. Out of the 18 stories, 11 are duplicates (indicated by arrows). That’s not a great ratio. What this means is that for one day I saw over 280 Reddit stories in my feed reader, while another popular (more popular, in theory) social news site, digg.com only had 75. So using the screen to the right as a sample, out of those 280 stories, about 171 (61%) will be duplicates. So maybe this is a one-off? Unfortunately not. Scrolling down just one page of RSS entries reveals the following stories from Reddit (see image to the left). In this snapshot, we’ve got 13 duplicates. And not only that, we have one story that appears four times, three of those times consecutively. I don’t know what’s causing these duplicate stories to appear, but it’s clear that there’s no quality control happening on the RSS feed side of Reddit’s business. I’d like to introduce you to a friend of mine who’s been going through a rough time recently. 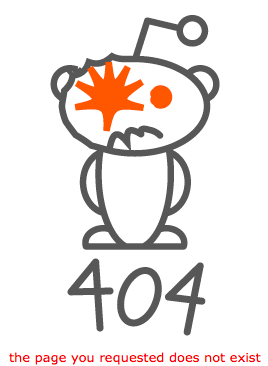 It’s the Reddit Alien, and he’s looking a little beaten up. This is the image that greats you every time you request a Reddit page that doesn’t exist. Unfortunately, I’ve been seeing this more and more. I chose to read 10 stories from the Reddit RSS feed and 4 resulted in a 404 page being displayed. The important thing to remember here is that these are the Reddit pages that can’t be displayed, not the page on an external site being linked to. The RSS feed is asking me to visit a page that doesn’t exist. I just quickly want to mention something else that annoys me about the Reddit RSS feed. The URL the item links to is the external site, not the Reddit page. This is important because the item being linked to could be literally anything. It could be NSFW when I’m at work, it could be a virus, it could be a spam site, it could be anything. And given the opportunity for stories to hit the Reddit front page without that many (relatively) up mods, you do, at times, have to tread carefully. I want check out the comments before visiting the link. The decision to use the story url in the RSS feed has two problems. Firstly, I lose much of the social aspect of Reddit if I just visit the story straight away (actually, I can view the story without ever visiting Reddit) and secondly, Reddit are losing out on page views. Contrast this with digg.com, who’s RSS feed links to the digg page for the story. For sites such as these, it seems like a no-brainer. As a fairly long time user of Reddit, I think I agree with others in that its popularity is directly inversely proportional to the quality of the service, and the stories it covers. So as the site becomes more popular, the stories get worse. Hopefully it’s not too far gone, and we can have our Reddit back. I agree with you (except your opinion of the Reddit RSS feed). This kind of posts should make it to the first page, even though I doubt it will happen. Btw, thanks for the reference on Mixx, didn’t know it existed. It could replace reddit in my feeds reader. I am new to reddit and needing to know my feed URL. The help page on site tells nothing on that and google led me here…. Is the Reddit Fee still available? If so, in what’s it?